Dualog's Innovation Garage develops products for the maritime industry from their home base in Norway. The group sponsors information technology developers, shares information through its wiki and GitHub, and sponsors hackathons. As part of the Make 100 project at Kickstarter the Innovation Garage is running a crowdfunding campaign for their ProtoSwitch board, a breadboard designed for easy documentation. The ProtoSwitch board is based on the idea that we work on projects, then move on to whatever emergency or responsibility interrupts that work, and when we return the momentum can be lost. If documentation isn't completed then it's difficult to remember what we were doing, and which pins we were using. The ProtoSwitch board allows users to trace cables and label the connections to delineate which wires go to which components. Ten different sets of headers have five male and five male connections each, and the labeling section for the board is designed to fit a business card. The board itself is built from 'biodegradable and bioactive thermoplastic aliphatic polyester derived from renewable resources such as cornstarch." 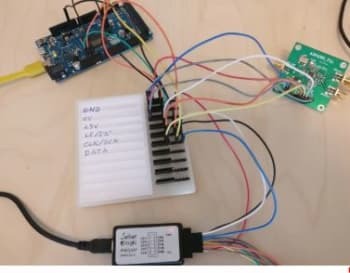 Innovation Garage keeps a list of projects on their website and on GitHub and encourages users to upload their projects to the website if they use the ProtoSwitch board in a project's development. The campaign shows an example project of a bedroom alarm to keep out younger siblings, and then points to the documentation on GitHub. As a tool the ProtoSwitch board is incredibly simple while performing a function that could help most makers during the life of a project. I always stress to my students that we add comment lines and create documentation as a habit because we're trying to save our future selves. My late forties memory gets more and more thin but notes almost always make a project easier to duplicate or improve. The fact that the boards are cheap (around $6 US) but shipping is expensive (around $15 US) is the only negative I see to this campaign. The Kickstarter has already blown by its modest $294 goal and ends on February 28, 2019.